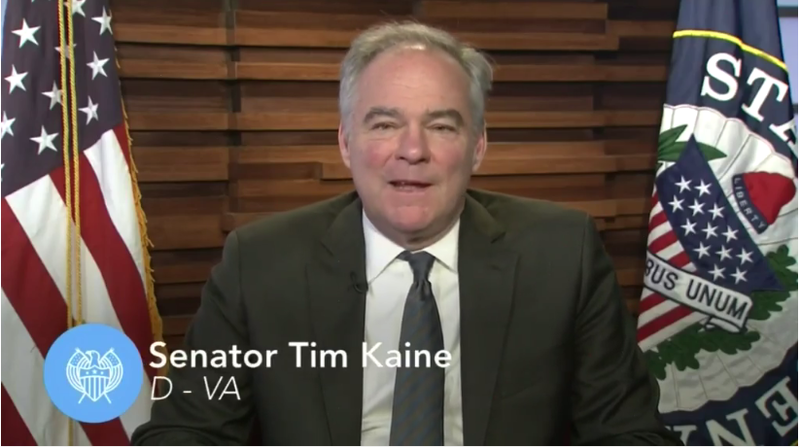 The Weekly Democratic Party Address was delivered by Senator Tim Kaine of Virginia. My Democratic colleagues in the Senate are working together to do all we can to protect health care. I hope our Republican colleagues will join us in efforts to make health care more affordable and accessible to all. We will keep encouraging the Trump administration to stop playing games to drive up health care costs for American families. The only way to get health care right in this country is to focus on real solutions that work for folks across the country. It is time to strengthen, not weaken our health care system. Hey, everybody, I’m Tim Kaine, Senator from Virginia. I wanted to talk about an issue that is critically important to every American, health care. And to share some good news and bad news. You deserve the peace of mind that if you or a loved one gets sick, you can get health care when you needed without facing mountains of debt. Because health care is a right, not something reserved for just those who can afford it. That is why we consistently push for reforms to expand access to quality affordable care. The Affordable Care Act helped us to provide health insurance to millions of Americans, but it was imperfect. That is why so many of us have pushed for improvement to the law. It is also why I have been such a vocal advocate for the need for states to expand Medicaid. In Virginia for years, Republican lawmakers stood in the way of hundreds of thousands of Virginians receiving care while still leaving taxpayers footing the bill. Last year’s elections in Virginia paved to the way for the state legislature and state officials that were finally ready to right this wrong. I am so proud that last week, the Virginia General Assembly cast legislation to expand access to health care for up to 400,000 additional Virginians. This huge accomplishment will allow people to get the care they need. Our communities will be healthier as a result, and I am so thankful for everyone in Virginia who fought tirelessly to make this happen. While Virginia has fought for progress, the Trump Administration’s actions over the past year have weakened our health care system across the country, and threatened access to care in Virginia and everywhere. First Republicans tried again and again to repeal the Affordable Care Act which millions of Americans rely on for care. With the help of so many of you who raised your voices, Democrats in the Senate and a few of our Republican colleagues successfully defended the ACA and we protected health care for millions of families. When the Trump Administration failed to repeal the ACA, they settled for strategic attacks that increased premium costs for American families. From eliminating the coverage requirement, to reducing the ACA enrollment period, to cutting off cost-saving reduction payments, the Trump Administration and Republicans in Congress have repeatedly taken the steps to attack health care in America. A few weeks ago, it was announced that they are proposing to raise premiums as much as 64% on Virginia families who get their care through the individual market, and most cited the Trump administration’s actions as a reason for these new increases. We have seen similar announcements from Maryland, New York and Washington. I will not stand idly by as Virginians are stuck with the painful consequences of the Trump Administration’s sabotage. It is very important that we not only act in ways to preserve the ACA, but also act to make it better. We need to pass a bill like the bipartisan Murray-Alexander legislation that we have worked on, to stabilize the health care market for the future. I hope Congress will take up my Medicare Access bill to provide more options for low cost high quality health care, and every zip code, used in competition and bringing down prices. The bill I have worked on with Senator Bennett of Colorado was built on the Medicare framework, to establish a public insurance plan. This would allow Americans to choose among the existing private insurance plans, or a meaningful public plan. It would be particularly helpful in rural communities across the country, where often, there are limited options and prices are too high. I hope Senate Republicans and President* Trump will finally join Democrats who are asking Leader McConnell, to spend the month of August working to pass proposals like these that bring down the price of insurance, and prescription drug costs for families. We need to continue the recent progress we made in Virginia, and expand access to affordable health care at the federal level. My Democratic colleagues in the Senate are working together to do all we can to protect health care. I hope our Republican colleagues will join us in efforts to make health care more affordable and accessible to all. We will keep encouraging the Trump administration to stop playing games to drive up health care costs for American families. The only way to get health care right in this country is to focus on real solutions that work for folks across the country. It is time to strengthen, not weaken our health care system. Leader Pelosi. Good morning. It’s an exciting week, and I’m not just talking about basketball. Q: You’re wearing your Capitals red. Leader Pelosi. That’s right. That’s what the people keep reminding me. Isn’t that exciting? Oh, that’s pretty exciting. Some things are what you expect, and some other things are new and exciting. Anyway, it’s been an exciting week, and on Tuesday, voters across the nation rejected the Republican majority in a very powerful way. They sent them a message rejecting their relentless efforts to destroy health care and reward the special interests. Thanks to the strength of the grassroots and our strategic investments, California in particular has advanced an extraordinary set of battle‑tested and diverse Democrats for the November ballot, but that has happened across the country. Across America, we’re seeing strong performances from Democratic candidates with a clear vision. They know their purpose and personal stories to tell. It is clear that hard-working American families are rejecting the Republican raw deal, instead are choosing Democrats’ Better Deal, Better Jobs, Better Wages, Better Future. It’s interesting because our candidates out there are talking about their vision, their purpose, their knowledge, their plan to help take our country into the future, and they are connecting with the American people in terms of the concerns, the aspirations, as well as the apprehensions that people have. So, it’s a pretty exciting time. There’s no doubt that President Trump was effective in getting his message across, and he was appealing to people because he was breaking ground. Break new ground. Unfortunately, the President broke ground and he has left it broken. He said that he was going to address the trade issue, especially the disparity in our trade deficit with China. And what is he saying now? That too many jobs are being lost in China. We have to help them to the point – at the expense of our national security. Rescuing ZTE, a known, clear cyber-security threat. Meanwhile, the GOP, again, their tax bill makes it profitable for businesses to create jobs overseas. But the China thing is remarkable. How much did he talk about that on the campaign trail? And now – then he goes on to say that too many jobs are being lost in China. They tried to put forth a compromise proposal, and I think we have to watch it very carefully. They were going to lower prescription drug prices. Remember when the President said, ‘We’re going to negotiate. We’re going to enable the Secretary to negotiate. We’re going to negotiate like crazy.’ And then he came up with his proposal. Negotiate like crazy, as you’ve heard me say before, must mean not negotiate at all. Don’t take my word for it: after the President pulled his punch on lowering prescription drug prices, that day, a couple weeks ago, just look at the stock market. Pharmaceutical stocks went through the roof. President pulled his punch again. He said he was going to drain the swamp. Instead, the President has become the swamp, and the GOP Congress refuses to take responsibility to hold his Administration accountable. What is it? There must be – how many – Pruitt has 15 himself – Pruitt himself has 15 Inspector General investigations going on him alone. Six Cabinet officials have been under Inspector General investigation for waste, fraud and abuse. Again, don’t take it from me. Senator [Joni] Ernst said of Scott Pruitt: ‘He’s about as swampy as you get here in Washington, D.C., and if the President wants to drain the swamp, he needs to take a look at his own Cabinet.’ That’s a Republican Senator saying that about the President. The President was going to reduce the debt. The Republicans were going to reduce the deficit and reduce the national debt. Instead, they’ve exploded the debt by $2 trillion with their tax break for the wealthy and giving big tax breaks to corporate America. With interest on that debt, over $2 trillion added to the national debt. And what’s sad about that is the dark shadow it places over the budget, the future of our seniors and our families and our children. And so what’s interesting about it is when the Social Security and Medicare Trustees made their report and they said that Medicare now becomes insolvent by 2026, that’s three years sooner than it would have been. They specifically cited the tax bill as one of the reasons why. So, again, their tax breaks, they’re hiring friends, 83 percent of the advantage of the bill going to the top 1 percent, almost a trillion and a half dollars plus interest given to corporate America. And who pays the price? America’s seniors. Look at the Trustees’ report. So, in any case, here we go to the Floor of the House. This week, we have a bill on the floor, the Energy and Water bill. It slashes clean energy initiatives, attacks job‑creating investments and guts funding for nuclear nonproliferation priorities. The bill has poison pills in it that allow deadly firearms to be carried on public lands, assaults the clean water of our children. Clean water of our children. What could be more fundamental than that? As a mother of five, grandmother of nine, one of the reasons that I’m interested in public policy is for things I can’t do for my children. I can’t ensure that the water they drink that comes out of that spigot is safe for them, that the air they breathe is clean air. There are public health issues that are affected by this bill. Republicans, they encourage pollution of our oceans and push our nation’s already endangered species toward extinction. So this is a bad bill, and we are urging a ‘no’ vote on it. But in any case, one of the other problems with it is it takes money away from our investments in health, education and good-paying jobs in America’s communities. As you know, this morning, the Republicans are meeting on immigration. Lord knows what will come out with that. Hopefully, the Lord knows. We’ve been praying very hard on it. For too long, young Dreamers across the country have been stuck under a cloud of fear and uncertainty. As you recall, in 2010, we had majority of the Congress, we passed the bill in the House, it got a majority of votes in the Senate, but not the 60 votes needed for passage. All this time later, we are still trying to protect the Dreamers. We thank them for the dignity in which they have advocated for their situation, and Congress must do something to address the concerns of these extraordinary patriotic young people. “Tonight, the Trump Administration took its cynical sabotage campaign of Americans’ health care to a stunning new low. “Once again, Republicans are trying to destroy protections for Americans with pre-existing conditions. The Trump Administration is perpetuating the same cruel vision of higher costs and less coverage that House Republicans voted for in the monstrosity of Trumpcare. “From day one, Republicans in the Administration and Congress have spitefully worked to undermine affordable health care, and drive up families’ premiums. Millions of Americans are already facing unnecessary premium hikes because of the GOP tax scam and the GOP’s efforts to push families into shoddy junk plans. Washington, D.C. – House Democratic Leader Nancy Pelosi delivered remarks on the Floor of the House of Representatives to voice her opposition to H.R. 5895, Energy and Water, Legislative Branch, and Military Construction and Veterans Affairs Appropriations Act. Welcome back from the Memorial Day district work period. As Congress returns from this time of reflection in our communities, it is important that we fight harder than ever for the priorities of the families we are privileged to represent. We write to urge you to oppose the Republican minibus appropriations bill on the Floor this week, which fails to honor our obligations to protect the health, security and well-being of the American people. This so-called minibus legislation will include three appropriations bills: Energy and Water, Legislative Branch, and Military Construction and Veterans Affairs. This GOP minibus is the first step in Republicans’ plan to choke off funding increases for critical Democratic priorities for the health, education and economic well-being of America’s working families later in the appropriations process. House Democrats’ strong opposition to Republicans’ cynical strategy last year gave us powerful leverage in the omnibus. That leverage enabled us to fight off Republicans’ poison pill riders and secure dramatic increases in funding for key priorities, such as veterans, health and biomedical research, the opioid crisis, education and child care, and election security. That included nearly doubling funding for Child Care Development Block Grants, achieving a $3 billion increase for the National Institutes of Health, and providing $380 million in Election Security Grants. – Slashes funding for critical nuclear non-proliferation priorities. – Push our nation’s already endangered species towards extinction. House Democrats must stand together once again, to fight for the priorities that matter in the lives of the American people. Thank you for your ongoing leadership in this mission. And let’s not take our eyes off earned benefits like Social Security and Medicare. “The staggering costs in the lives of seniors from the Republicans’ brazen corporate and special interest agenda become clearer every day. The GOP tax scam’s massive, unpaid-for giveaways to the wealthiest 1 percent and big corporations have gravely undermined the future of Medicare and Social Security, and now Republicans want America’s seniors to pay the bill. “President Trump promised to defend the promise of Medicare, Medicaid and Social Security, yet he has fought to slash trillions from these pillars of health and security in his budget. His most recent plan to move seniors’ prescriptions from Part B to Part D will further endanger these vital initiatives, while also skyrocketing out-of-pocket costs for some of the sickest people on Medicare. Thanks for this, Jan! I can only wonder at people like my cousin in Texas, with whom I spent a large part of last weekend (she and her husband were heavenly to Miss Pink Cheeks), voting Rethuglican against their own best interests. My cousin’s husband, a very nice man, was diagnosed with glioblastoma 18 months ago. Naturally he lost his job as a driver for Fed Ex. My cousin told me that next month his COBRA benefits will run out, so she hopes he can get on “Obamacare,” as she called it, until January. He will then be 65 and eligible for Medicare. But hey, bankruptcy is better than gays and abortion, right? The selfishness and hatefulness continue to boggle my mind and roil my stomach. I think the position I find the most confusing is that people who have pre-existing conditions should be uninsurable. It is amazing to me that a person could go through life and never know someone who had the sudden onset of an illness that tagged them with a pre-existing condition. Or never known a family with a child born with a condition that require special medical attention and now are flagged for the rest of their life. Any test at any time can put a flag in your medical file that can be used to deny insurance. They really want to go back to those days? I was on a telephone town hall with Senator Ron Freaking Johnson and a woman was in tears describing her child who needs care and who could not get insurance until the ACA and who would lose coverage under the Republican plan being voted on at the time. He said that there would be High Risk Pools to handle that – completely ignoring the fact that the HRP Wisconsin had pre-ACA collapsed when the premiums got so high people could not afford to opt-in and it ran out of money and folded. You could hear the gears spinning for Johnson – “good, a quick death then one less ‘taker’ burdening the ‘makers’ bottom line.” What they want to do is cull the herd – a horrifying concept in the richest country in the world.